For many years, I made homemade fried onions for my traditional green casserole. I'd found a few gf brands of onions, but none were good enough to buy twice. Last year I finally found a decent tasting shelf stable fried onion - Loeb's - at Publix. They were packaged in a bag and are now in a plastic jar. Either way, the onions were a suitable substitute for the French's brand of fried onions many of us grew up with. 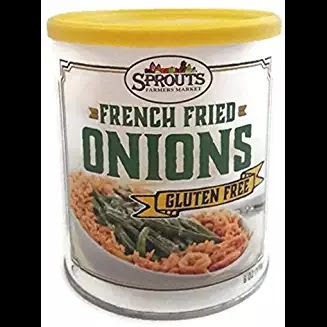 Then, last month, an email from findmeglutenfree announced the availability of several brands of fried onions just in time for the holidays! I noticed that the Sprouts brand was listed so that's the product I decided to try. They are possibly the exact product from Loeb's as the ingredients are exactly the same (onion, buckwheat, vegetable oil and salt). However, for some reason I can't pin down, I prefer the taste of the Sprouts product. Aldi has a similar product which I'll probably try eventually. So far, nothing tastes just like the French's brand, but that's okay. That product has a form of sugar in it which, like many people, I can do without. PRODUCT NOTE: buckwheat is in fact, not related to wheat - nor is it a grain. It's plant based and is completely gluten-free.